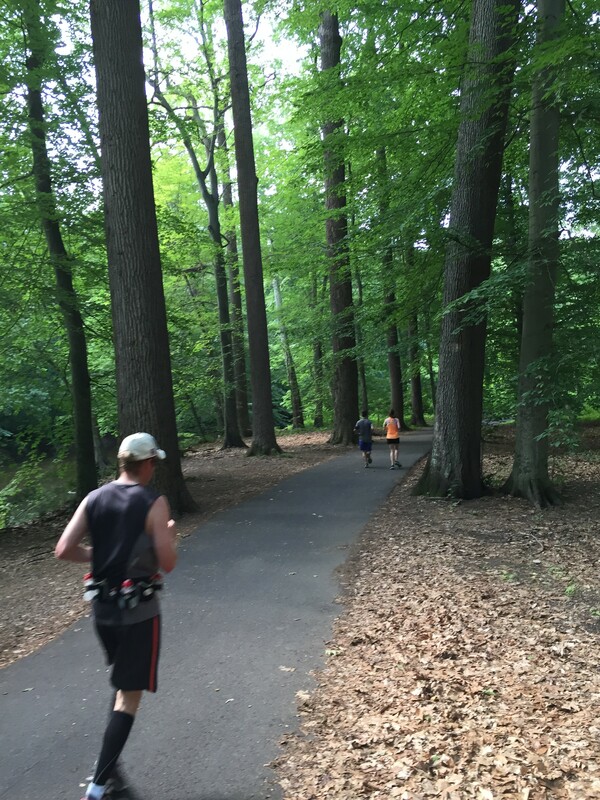 Sometimes you just have to play it safe: My Keystone State Goofy Challenge | Eat, Run, Crash. Posted on July 3, 2015 by Rebecca B. That's Me! In order to prepare for ultra-running, I decided it was important to do back-to-back long runs and get myself used to the idea of running on tired legs. Recently I was supposed to run a back-to-back race weekend: a full marathon on Saturday (the ½ Sauer ½ Kraut Marathon) and a half marathon (the ODDyssey Half Marathon) on Sunday. I was pretty excited, and felt ready. I wanted to take it super easy for the full, maybe a 5 to 5:30 finish in order to toe the start line on Sunday with somewhat fresh legs. But in the end, I had to change those plans in order to safely cross the finish line both days. During the week before the race, I received an email informing me that they were going to cut the course time limit to 5 hours due to possible inclement weather and heat/humidity warnings. The course for ½ Sauer was a double-out and back course (kind of like a needle actually), so the full marathoners always had the option to cross the finish line early if they wanted to just end it at the halfway point. The medals and shirt are the same regardless of the event you decide to run. But with a five hour limit in place and heat warnings that would get us close to a 90 degree heat index by noon, I had a feeling there would be a lot of marathoners that were going to downgrade, or just completely DNF. Rather than DNF (which is something I absolutely REFUSE to do), I decided to just flat-out downgrade. Why not? I know that I could easily run a sub-5, but had no idea how the heat might affect me during the second out-and-back, and God forbid I get stuck out on the racecourse past the 5 hour point because I’m suddenly falling apart from the heat. My intentions were to run an extremely slow full to begin with, but now I was just going to stress having to push myself more than I planned in order to finish under the cut-off time. 1. This race was in PA, by no means a new state medal. I didn’t have to travel far for it and I had a few PA medals already. 2. I had a half marathon the next morning and needed to feel like my legs could handle it. If I pushed past what I planned, pace-wise, I might have suffered a little unnecessarily on Sunday. So, all in all, easy decision, and I’m so glad I came to this conclusion! I had a fantastic weekend and a total blast both days! I even managed to run a decent half on Saturday, despite the heat! 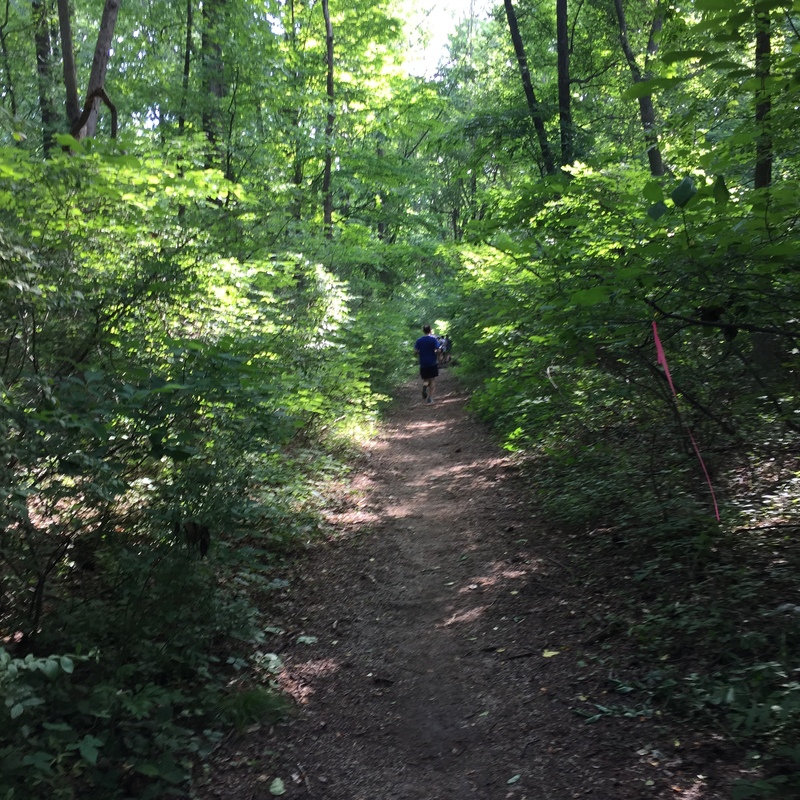 This was a German-themed race that was to take place in Pennypack Park in Philadelphia, and the best part about it was that it was 95% shaded, and even had a fun trail section. It was an out-and-back course and had some fun water stops with people dressed in Leiderhosen, not to mention my very favorite aspect of all, the accordion music of UberHans, my temporary weekend crush. Sorry, I can’t help it, I’m a sucker for a guy with an accordion and leather shorts. This was the first real race where I wore my CalmelBak, and I’m so glad I did. I managed to drink from it every mile and carry my own fuel, as well as my phone to take a few pics along the way. I was wondering if the CamelBak would slow me down? Not in the least, if anything, the extra hydration really helped push me to the finish. The first few miles I definitely felt slow and sluggish, and a LOT of runners passed me. I didn’t even care, I really wanted to be conservative with the heat. It was actually a somewhat pleasant morning as long as there was a breeze and we stayed out of the sun. There were only a few small sections with full sun, and good LORD was it warm. If I had to run a race in full sun like this, I don’t think I would have done well at ALL. Having the CamelBak allowed me to blaze through the water stops, and honestly I liked not contributing to the waste with cups (and being able to drink as much as I wanted rather than just a small cup). Being as warm as it was I definitely drank more than a water stop would be able to provide. The best part of the course was definitely the trail section. What a blast! I’m really learning to love trails. Sure you run slower, and it can get a little dicey with the terrain, but they are SO much more fun than road. The ONLY thing about trails I get frustrated with is when I feel like someone is breathing down my neck and wants to pass on a single track. Luckily that doesn’t happen often, we all sort of respect each other’s pace and just run single file. And personally, I don’t mind applying the brakes if there is someone in front of me that’s slower…with trail you have to just take it a little more carefully and watch your step and respect your fellow runners. It was fun to be able to run this part of the trail, as it will be part of an ultra course I will be running later this year. So heading back I was feeling good, and decided to pick up the pace a little. This is when I noticed that all the people that flew past me in the very early miles were suddenly running a lot slower, some walking, and I was passing THEM. I’ve learned from past mistakes, and know that starting off too fast sometimes equals a crash and burn later, especially if the temperatures are rising. So I’ve learned to slow my role a little. Approaching the finish line I was happy to see I managed a 2:02 finish. It was funny, the race director was trying to direct me to the turn-around for the marathoners, but I just shook my head and finished the half with a smile. I was fine with that accomplishment for the day! Packet pick-up the morning of the race! Always a plus for out of towners! Amazing finish line spread! You get a little bit of food at the finish, which for me was just watermelon (but I love watermelon at a race so no complaints here! ), but you also get two tickets to get a meal back at the German Club where you park…and they had a full spread, burgers, bratwurst and sauerkraut, sausage, soft pretzels, French fries, the list goes on. The other ticket is for a beer of your choice, though if you can’t have beer like me, they have a full bar to make one drink of your choice. Probably one of the best post-race spreads I could enjoy! UBERHANS! He played before the race start, and also on the course, and it was: THE. BEST. I made sure to tell him so. Small enough field to possibly earn an AG award, though I was 9th out of 44 or so for mine. Oh well! The medal you earn is for the half AND full. I realize WHY they do this, because they won’t know how many people decide last minute to downgrade to the half. After all, this is something you can do as you’re approaching the finish line! So basically I didn’t miss out on anything swag-wise. The race takes place in mid-June, so it’s a guarantee to be hot and have a risk of thunderstorms. The course is mainly an out and back, try doing it twice for the marathon. Might not appeal to some. 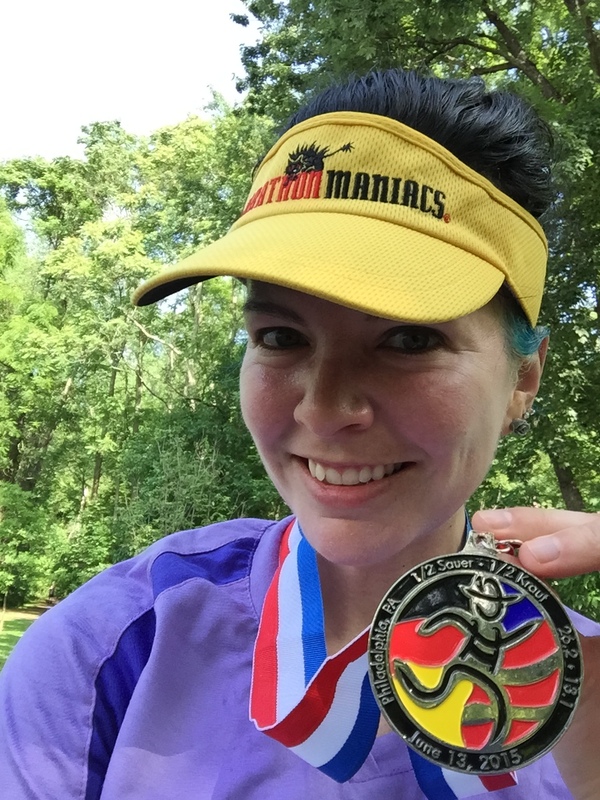 So the next morning it was Round 2, the ODDyssey Half Marathon in Philadelphia. 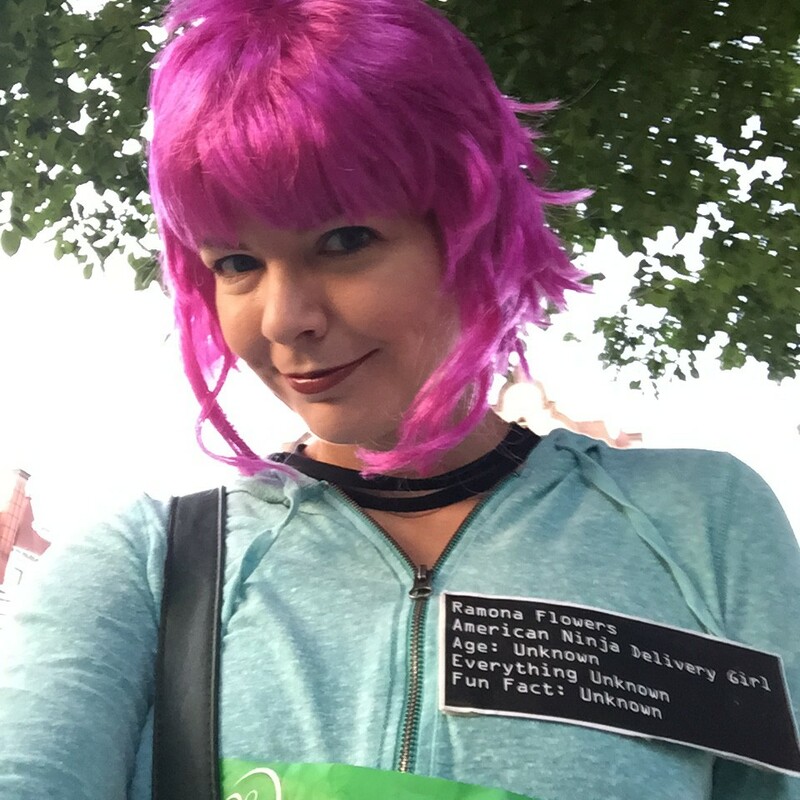 This one was going to be very conservative pace-wise, as I would be in costume (like a lot of the other runners, it’s part of the race’s charm) plus I already committed to sticking with my friend J as much as possible and keeping her pace. My friend M decided to join us, and the three of us made sure to get there early in order to find street parking, and it was a piece of cake! We all made sure to dress in costume, and I decided to dress as Ramona Flowers from Scott Pilgrim Vs. The World, a costume I have worn to several Halloween parties in years past. Chris even made me a mallet to carry, and considering we made it out of stuff we found around the house and didn’t have to spend a dime, I’d say he did a great job! This is about as legit as I could get to make it a running costume. No way I could run in my knee high Hot Topic combat boots. Because of the heat warnings, it seemed like a lot of people bailed on wearing costumes, which was a huge disappointment; I was just really into it I guess! And, as expected, only a few people knew who I was dressed as, which was fine. I assumed only video game/comic book nerds would know who I was anyway. But the ones who did LOVED the costume and said it was definitely the best one they had ever seen, so that was nice to hear. I do like to go the extra mile when it comes to things like that, I’ve always been that way. The race was fun, and went through areas I was familiar with from parts of the Philly Marathon and from Team in Training practices. The main issue was the heat, there wasn’t a lot of shade on the course, and it wasn’t especially breezy to help cool us off. But to help that, almost every water stop had a sprinkler to run through! Whoo hoo, it was awesome and very refreshing! ODDyssey boasts games and obstacles along the course, but I saw very few. They had gigantic beer pong (basically throwing a volleyball in a bin), a ring toss, and throwing a softball at a milk bottle pyramid. I actually got the beer pong on the first try! But I was a little disappointed that the games weren’t better. The water stops were also a problem. Because we were taking it a lot slower, one of the first stops already had run out of Gatorade. The stops were kind of disappointing as well. I found myself grabbing a lot of my own water. I left my CamelBak at home since I assumed there would be plenty of stops on the course, but the stops seemed to be sorely lacking in volunteers. They just couldn’t seem to keep up with the steady stream of thirsty runners. Though the ones they had were friendly and cheerful, on a whole. I stuck with J until around mile 12.5. I did a lot of walking, and running intervals, and by the time we got to the last .7 miles, which was uphill in full sun, she told me to go on since she knew I wanted to finish. The sun was pretty brutal and I was glad to get this one over with! It was great to approach the finish line; as I did there was a group in the stands that shouted “GO RAMONA!” and REALLY cheered me on…it was pretty awesome! 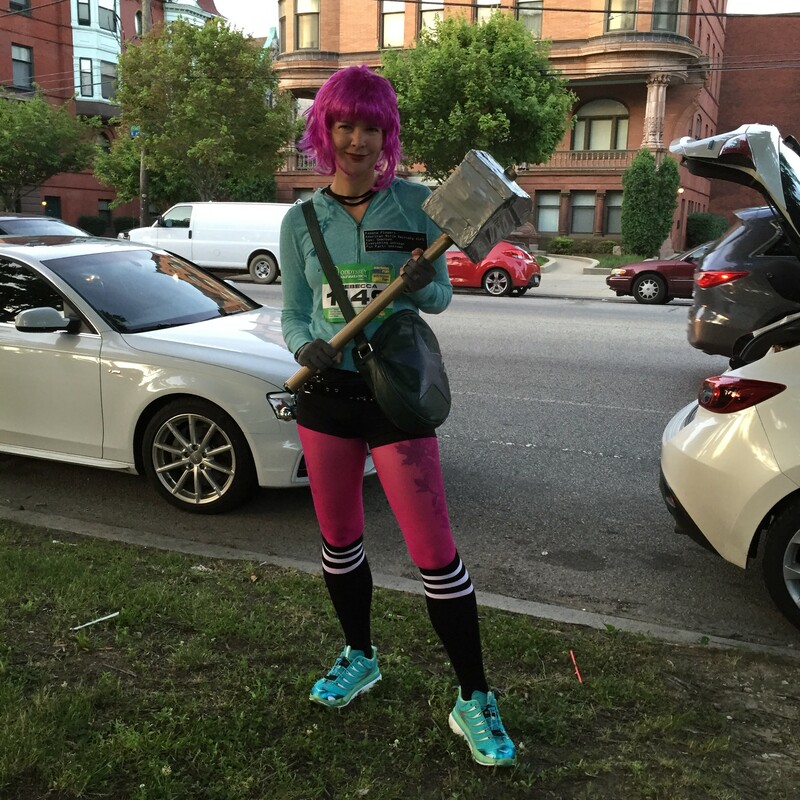 I still managed to have my mallet on me the entire time, which got a lot of props from people. I didn’t strip a single part of my costume off, and trust me it was tempting, but it was also nice to keep my skin protected from the sun. I finished in 2:53, and honestly, despite my finish time, I had a great time! Met a lot of nice people, even some really cool ultra runners, and was able to get some good insight and advice on training and events. I found the experience to be very laid back and fun. GREAT Swag! Nice shirts (you can choose from two different colors), a pint glass, and a medal that is also a bottle opener. Cool AND Functional! Fun atmosphere! I loved seeing people run in costume, especially since it wasn’t just Disney costumes, as I am used to seeing when I ran my Disney races years ago. They even have a costume contest, but since it’s heavily swayed by Facebook, I am a huge loser in this regard because I am Facebook-less (and have no regrets) and can’t promote myself. Games along the course, which I think were sorely disregarded by many runners, which is a shame. Take 60 seconds to play a game and have some fun! KIND bars and fruit were available at the finish line! I was actually able to eat! OK, this is a big one, but packet pick-up, rather than being the weekend of the event, is the weekend BEFORE. They may think this is doing us a favor, but a LOT of runners grumbled about it, and while they have limited pick up the Saturday before, they really only wanted out of town runners to be there. Morning of race packet pick-up? Only in VERY EXTREME circumstances. On the flipside, if you don’t feel like dealing with it at ALL, just pay a small fee and have the bib shipped to your house, but I think that means no shirt. Not a lot of shade on a hot course. You know my feelings on that. And really, for a city race not a lot can be done about that. Stops seemed to run out of Gatorade early. It really seemed like it was mainly available for the faster runners, and trust me, the longer you are out there, the more crucial the electrolyte drinks will be! No GF beer for this celiac, but who am I kidding? I only was given that golden opportunity ONCE at Myrtle Beach’s Marathon. But dammit, I am so tired of being promised free beer, and never a drop can I drink. That’s just my little gripe. Spectators are sparse except at the start and finish line. No fuel provided on the course, but I don’t know how common that is for a half marathon anyway. I could swear they usually have at least one. In the end, I had a great weekend with friends, and would love to run ODDyssey again! So my next big thing will be my trail ultra in August, though who knows if it will even be a true ultra. It’s a 6 hour challenge on a 6.5 mile loop on trails. My goal is a 50k (which is 5 loops), but considering the terrain and the time of year (translation: heat) I just may NOT be able to pull it off. But I will do my very best to try! This entry was posted in Running, Running and More Running and tagged 1/2 Sauer 1/2 Kraut Half Marathon, back to back races, costume race, ODDyssey Half Marathon, running by Rebecca B. That's Me!. Bookmark the permalink. Love the costume! If you had your bib shipped to your house, you got your race shirt at the race but they didn’t do a great job letting you know where to pick it up. Impressive job do those two races back to back! Great job! Thanks, and it’s good to know since I really hate doing separate packet pick-up. Might be worth the investment. It was a very fun weekend! Since I’m working on back to back marathons I need to get used to it a little bit! Great job with the back to back races and listening to your body. I live in PA and not far from either race but was away that weekend, or I probably would have done Oddyssey. My friends told me it was SO HUMID! Thanks! Funny, it was actually warmer that Saturday but the shade and breeze made it very tolerable. Sunday was pretty miserable, but what can you expect this time of year in PA? I’d like to run ODDyssey again but it’s likely I’m going to grab another state medal so likely will be traveling if the dates conflict. Hopefully we can meet at a race someday (and I’ll see you at the finish an hour after you finish, LOL)!